Wash and soak Basmathi rice for 20 minutes. Fry the rice with the ghee in a pan. Make the masala powder with the above said ingredients. Dry roast the masala powder ingredients expect tamrind. Grind the roasted ingredients with tamrind. Make it as powder without adding water and now masala powder is ready. Cut the eggplant in to vertical pieces and fry it in oil. Heat oil in cooker,add small onions and fry it till transulent. Add turmeric powder,salt and roasted masala powder and fry them well. Now add fried rice,water and fried brinjal to the cooker. Check the salt and put it in medium flame. Cook the rice for one whistle and switch off the flame. Garnish it with coriander leaves and curry leaves. 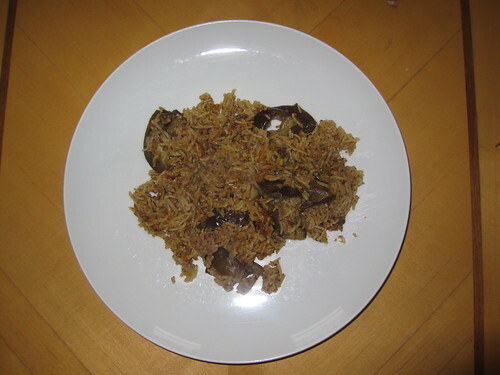 Now, Eggplant Briyani is ready to serve. 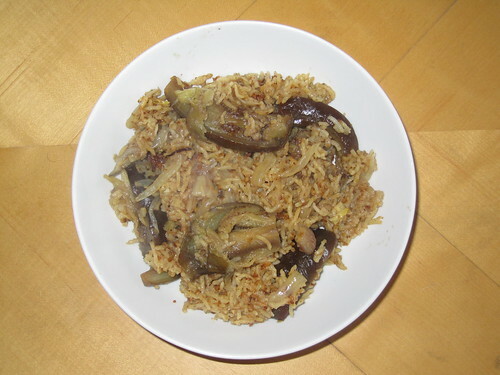 Eggplant Briyani can be served with Onion Raitha. This South Indian Recipe makes perfect lunch. Please Note : I am introduced by EC's Budding Blogger Series. I would like to thank EC for making my introduction in series. I am sending this recipe for the event Kavita's Healing Foods - Eggplant originated by Siri. I am also sending this recipe to Akila's - Dish Name Starts with E event. Ila.. this looks so innovative..
Can have this for a sunday lunch with raita... good one..